Tropical Server Review 2019: Is Tropical Server a Good Hosting? Tropical Server provides slightly pricey specialized CMS hosting for WordPress, Joomla, PrestaShop, and Moodle. Granada-based Spanish company Tropical Server started its journey in 2003 by offering web hosting solutions for open source portals, targeting its services mainly at Mambo and Joomla users. Having started offering Joomla hosting in 2006, this provider added other CMS software over time, including WordPress and PrestaShop. 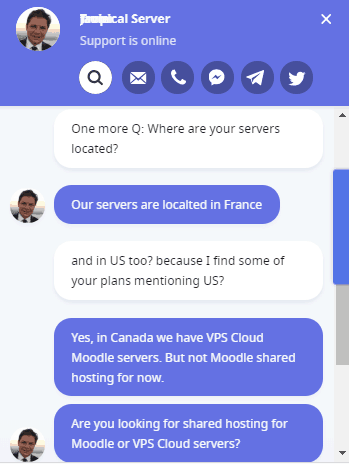 It has provided Moodle hosting packages since 2015. Alongside its hosting plans, Tropical Server also offers domain registration and transfer services, and a staging (or test) environment for WordPress, Joomla and PrestaShop websites. Tropical Server’s website supports Spanish. Tropical Server offers four shared CMS hosting plans for each of WordPress, PrestaShop, Joomla, and Moodle. Within each of these categories, the plans vary in terms of disk space (5 – 40/50 GB), databases (1 – 10), RAM (2 – 5 GB for PrestaShop and 1 – 4 GB for others) and disk speed (2 – 10 Mbps for Moodle and 10-40 Mbps for others). You also get more than 700 WordPress templates for free with all WordPress hosting plans. Cloudflare CDN and Railgun assure superior loading speeds, and the image optimizer helps you avoid poor image optimization that would otherwise slow down your website. NVME technology is used for even faster data access than standard SSD disks. Except for the Moodle plans, you can use three different speed tests (GTmetrix, PageSpeed ​​Insights, and Pingdom) to check page load speeds, or you can visit the company’s test subdomain to test the load yourself. In addition to its shared CMS hosting plans, Tropical Server also offers VPS hosting for WordPress, PrestaShop, Joomla, and Moodle, plus reseller hosting, managed VPS, dedicated servers, and elastic cloud hosting services. Tropical Server offers 99.9% guaranteed uptime, which is a little lower than the industry average. Tropical Server’s shared hosting plans are pricey. Even the most basic WordPress plan is almost double the industry average, and then you have to add on 21% VAT. But to put this into context, we’re talking about specialized CMS hosting on SSDs rather than vanilla shared hosting on HDDs. 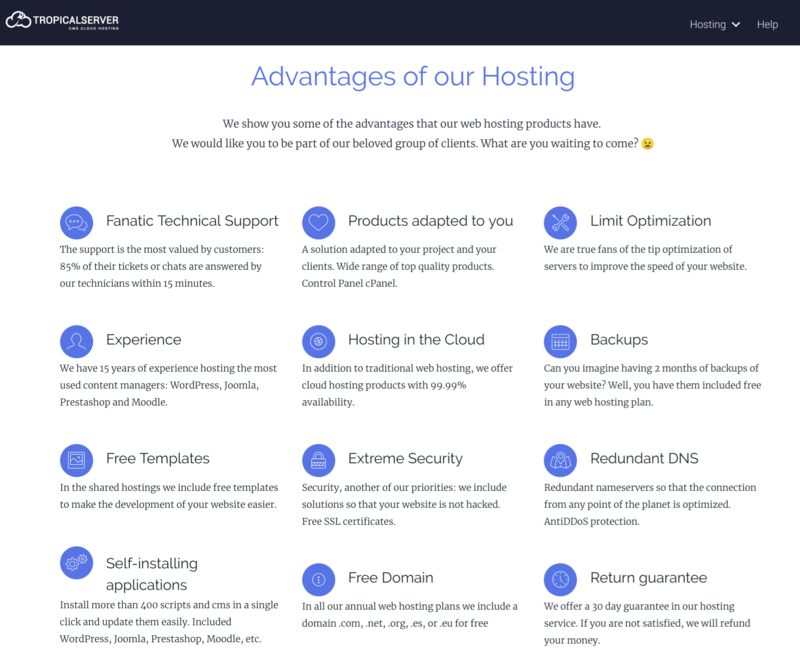 Hosting plans come with a free domain (.com, .org, .net, .eu, or .is) for the first year, but you’ll have to pay for your domain as an independent service in the subsequent years. All plans are payable annually in euros via PayPal, bank transfer, or credit/debit cards. If an annual commitment makes you uncomfortable, you can seek solace in the 30-day money-back guarantee that allows you to change your mind within the first month. You can reach out to Tropical Server’s technical and customer support via telephone, support ticket, and live chat. For self-help, you can tune into the company’s Help Center that contains a limited number of nicely arranged tutorials. The regularly updated blog is also worth reading. Although it’s expensive compared with standard shared hosting, you should definitely check out Tropical Server if you’re looking specifically for WordPress, PrestaShop, Joomla, or Moodle CMS hosting. For CMS hosting from Spain, see Tropical Server. Wondering how Tropical Server stacks up against other Web Hosting companies? Enter any other Web Hosting company and we will give you a side-by-side comparison.